It was a while back when I encountered this poem from the polymathic Lewis, that master of words and fantasies and reality. It is an astonishing poem (some suggest his greatest). I love its elemental vitality – and the complete absence of sentimentality despite being so evocative of powerful emotion. 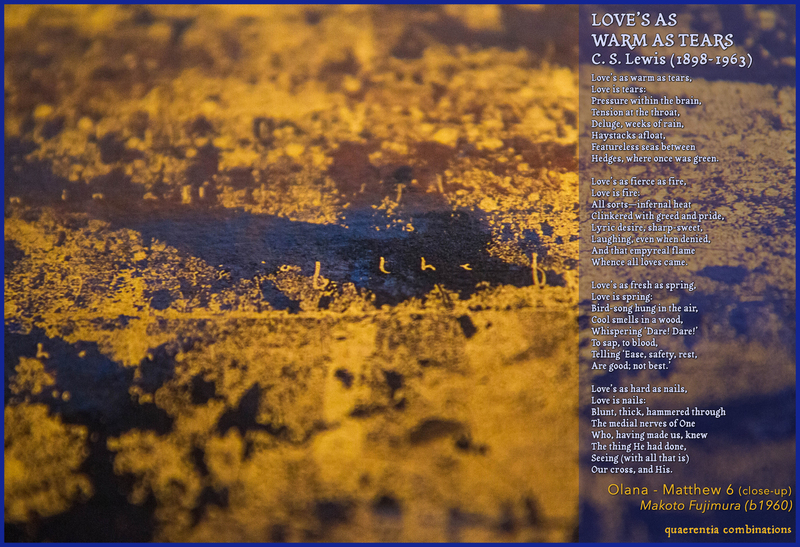 This is truly about the grit of elemental love, the rawness of divine love. But we only really grasp the point in the fourth stanza. Only then is it explicitly Good Friday love. So I wanted to find an image that was somehow equally elemental. 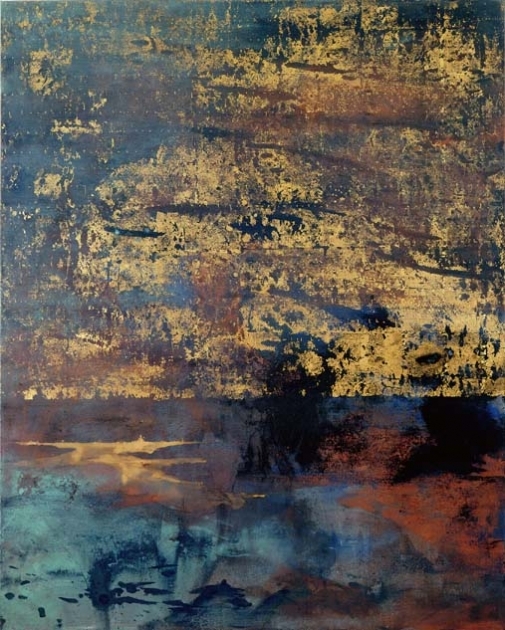 And it struck me that Makoto Fujimura‘s glorious work was the perfect partner. An embarrassment of riches to choose from, really – not least his stunning Four Quartets images (themselves inspired by Eliot’s masterpiece). In the end I plumped for this one (left): Olana-Matthew 6. That of course refers to the great discipleship gauntlet laid by Jesus in the Sermon on the Mount – the challenge to prefer reality over appearance (eg in dependent prayer), sacrifice over indulgence (eg in fasting), trust over fear. In fact, these are precisely what we would expect of elemental, divine love. Then I noticed a close-up of a small portion online, which seemed to be even more apt. Not sure of it’s origins (if anyone seeing this knows, happy to give credit where due if not Fujimura himself). Click on the image to see it more clearly.